So, after waiting and discussing about this for a long time. 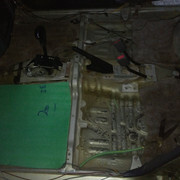 I decided to start working on my first D.I.Y project for my car -- a Cuore CX AT 2007. I had been reading several D.I.Y topics on pakwheels, and finally i opted for Diamond Jumbolon Roll (12mm) which surprisingly wasn't so easily available from a couple of interior and/or carpet shops around Islamabad. I had been experiencing a little rattle/vibration and general road noise at medium to high speed, even with balanced and aligned tyres. So I decided to go for this project knowing that I pretty much only have a carpet and the nylon cover on top if it. 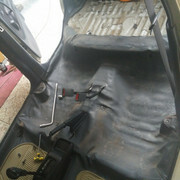 I got started with removing seats one at a time -- you will need a 12mm (12 number) ki goti (along with a rod ofcourse) to remove the seats. 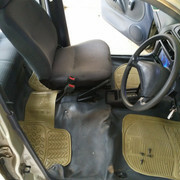 Front seats have 4 bolts, two front and two back. 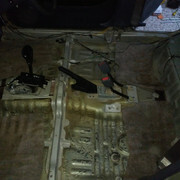 After removing seats I also had to remove the cover/housing of the gear lever and the bolts for seat belts (mine were 15mm), remove the black rubber lining and take the floor mats out. 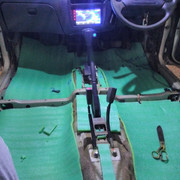 once at that is done, now it was time to gradually and carefully remove the nylon and carpet (i did it one layer at a time), which took quite some time and it was started getting dark and hence a low light picture. Once its all removed, it was time to measure and cut the jumbolon roll. 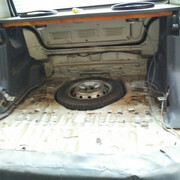 I mainly planned on filling the floor under feet and seats. You can try pressing it a little after placing it, so that it takes the shape of the floor or may use a suitable adhesive, for me, Cementex Adhesive (NT-80) worked well around the edges. While placing the sheet, please make sure that you don't block or fill any drainage holes and/or gaps and also avoid putting pressure on any wire. 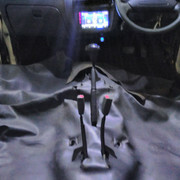 An important note: you may not put the jumbolon sheet around the sides of your gear lever or hand brake as it might not let the cover/housing fit back properly. As you can see, i placed the sheets and later had to get rid of them. 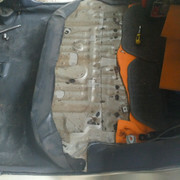 Once you are all done, it is time nicely put back the carpet and nylon on top if it. 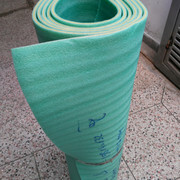 Putting back the carpet and nylon might give you a little tough time because of the newly added jumbolon sheet. 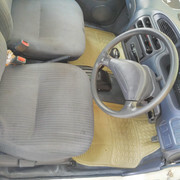 along with that I had to screw back the the seat belts, and back seat, then front seats and eventually the gear lever cover and that got me really very tired so took this last pic next day. - Overall, i believe i got rid of 70-80% noise. Had you also considered coupling open cell foam or namda with jumbolon. Actually as per my info, jumbolon is a sound blocker not absorber, could be wrong though. I am also in research phase of this type of DIY for my charade. Should also have increased the AC cooling. Did you notice? i think so too. 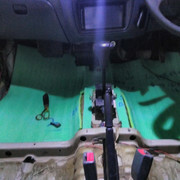 However, for me, there were some bits and pieces of namda sort of rubbery layer on top of bare floorboard and hence I didn't get/add namda with jumbolon. while it did have a good effect on the general noise, i have yet to test it out with AC. As I'm planning to use the remaining jumbolon behind door trims. 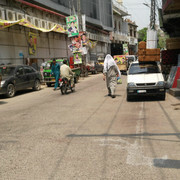 Nice work done... What about roof? Nice work, keep it coming.